Google Ads has a new format for text ads that lets you upload as many as 15 headline variations and 5 descriptions. Google mixes and matches for best results. Here's what you need to know. 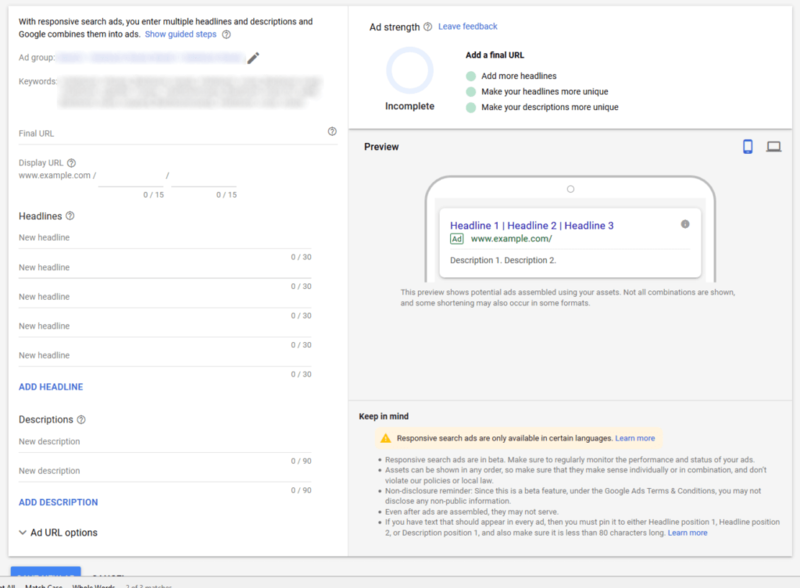 Google Ads is always testing new formats for ads that appear on search results pages. In the beginning all the ads were on the right rail and text was very minimal. You were allowed up to 25 characters for the headline (which would be bolded), up to 35 characters each for two lines of description text, and up to 35 characters for your display URL. Writing ads that fit those limits was an art form. Then Google moved ads into the main column of results, just above organic results. This was in response to increased search volume on mobile devices which didn’t show the right rail. However, this made the short text ads look out of place on top of longer organic listings. 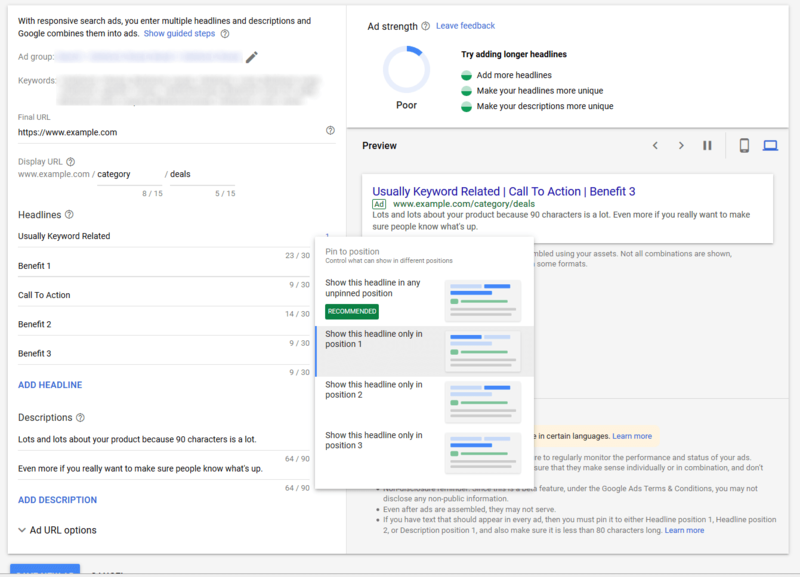 Eventually Google Ads added a second headline and then added characters to the headlines (up to 30 characters) and description line (now 90 characters). Now the standard text ad features 3 headlines of up to 30 characters, 2 description lines of up to 90 characters and two paths added to the display URL of up to 15 characters each. What was once 95 characters of text became 270 characters (and I’m not even going to get into ad extensions and how much more they can add). 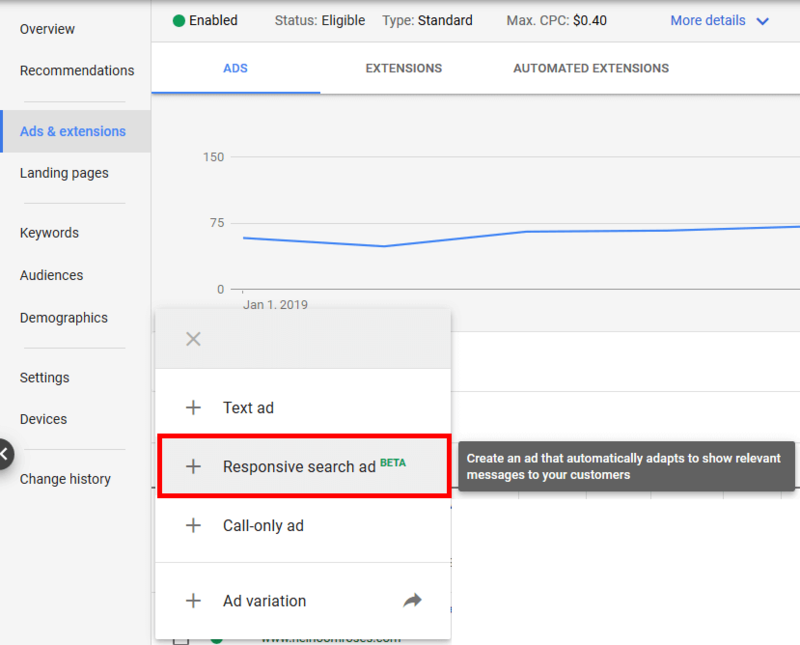 Google has now introduced an even more robust ad format called Responsive Search Ads. These bad boys allow advertisers to add a virtual novel’s worth of ad copy. How much is that you might be asking yourself? First you go into an ad group (pick one with as much traffic as possible, for reasons we’ll explain later) and click the blue “+” sign to create a new ad. In the dialog box that pops up you will choose “Responsive search ad” which they have labeled as a beta product. Headines – up to 15 characters each and while only five appear by default you can add ten more! Preview – this shows some samples of possible ad combinations. You can toggle between desktop and mobile with the icons on the right side. That’s a lot going on for one ad, so how does it look once you’ve got a few things plugged in? First off, you’ll notice that with just 5 Headline variations and 2 Descriptions I’m getting a score of “Poor” with advice to add more headlines, more descriptions and make them all more unique. This image also shows a dialog box that pops up when you click the little push pin icon next to a line of copy. This gives you the option to “pin” a certain line of copy into a certain position. I usually pin my H1 with the line that is relevant to the keywords. You could pin a specific call to action. Maybe your industry requires certain copy and you can pin it to ensure it shows. Of course, Google doesn’t recommend you pin anything, but that’s their prerogative. Since Google is “grading” the ad it makes sense to wonder how you can get better grades. I was able to get a check box for enough headlines after I wrote the 9th one. I got a green check on the descriptions when I finished the 4th one. Part of getting the green check mark for uniqueness is using a large proportion of the available characters. However, I will warn you that with 9 headlines, 4 descriptions and a uniqueness check mark I still only reached “Average” on the grade. I actually filled out all 15 headlines and still couldn’t do better than Average. So they have high standards. How Can I Know What’s Working? Oddly enough one of the descriptions here got 0 impressions. It’s like Google doesn’t feel like it’s compelling enough to even use. And as you can see with the headlines there is some definite favoritism going on. The second report will show you all combinations that got impressions. As you can imagine, there can be a lot. Like hundreds to thousands depending on how many you put in. So Should You Test Them? There are two main drawbacks for me. The first is the scarcity of reporting. If I’m going to put in all this copy and let Google do the serving I want to know more than just impression data. I want to know which copy gets me clicks and conversions. Secondly, it takes a ton of impressions to get statistically significant data. Even machine learning can’t overcome a lack of data so Google is really shooting in the dark until there is a lot of data behind one of these ads. So if you’ve got a lot of traffic in some ad groups and want to give Google a longer leash, give it a go. But right now I think many advertisers can leave this beta on the bench.